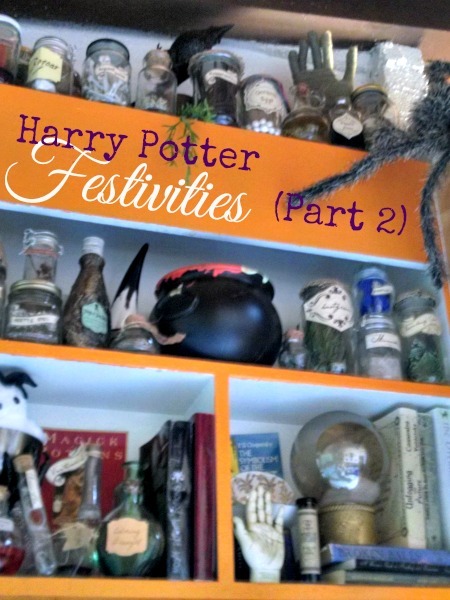 Late last month I gave you a big Harry Potter post to celebrate Harry's birthday and promised you more from the various activities that happened over the next week. I have acquired quite a few more Potter things since that first post about my Christmas Snape, so my house is more and more like Hogwarts every July. 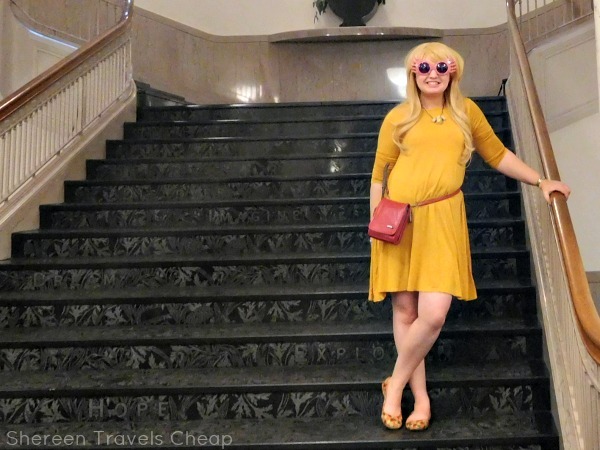 Here's how I celebrated my magical week . This is my house's Potions cabinet with a little corner for Divination. 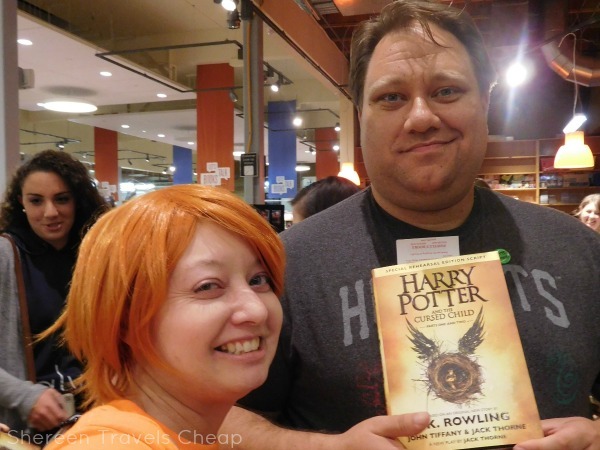 On July 31st at 12:01am, we were let into Powell's to purchase the new "book". I knew this wasn't a true Rowling book, since she didn't write it and it was the rehearsal version of the script of Cursed Child, and I had one preordered on Amazon, but then I really wanted to relive the excitement of midnight releases of the other books and go be with "my people". We played trivia games in line and chatted with some others around us. 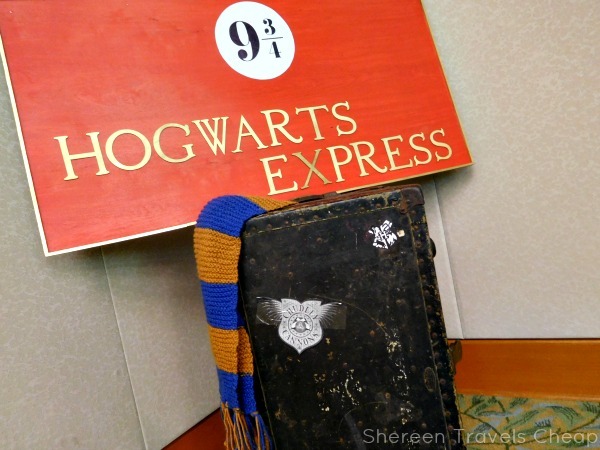 And, of course, we put on our Potter gear. 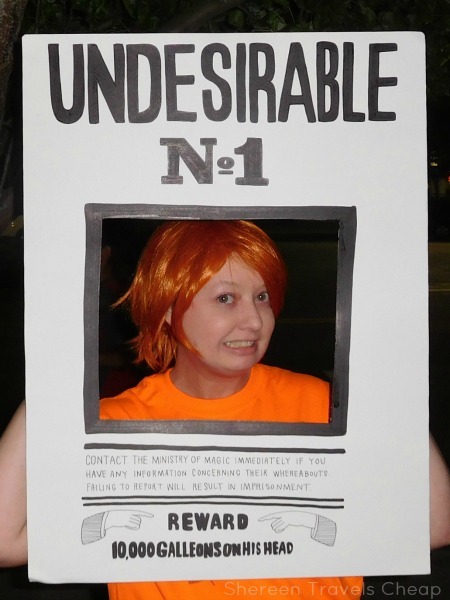 Eric seems way too excited to be an Undesirable. 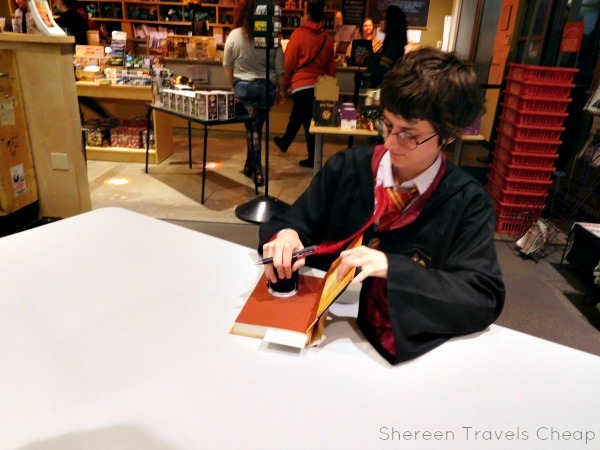 Got my book signed and stamped by "Harry Potter". 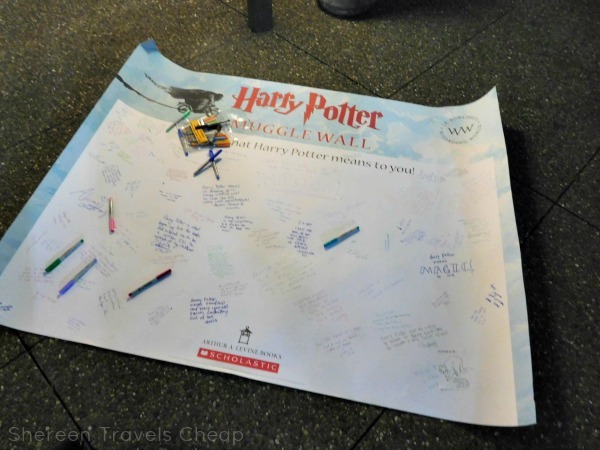 Loved this muggle wall that allowed anyone to share their thoughts about Harry Potter. 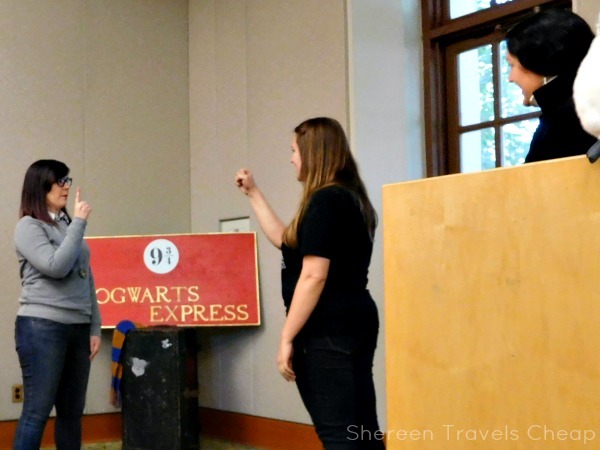 On the afternoon of the 31st, we headed to the main library in downtown Portland for Hogwarts Early Admission Program, an event put on by Portland's Harry Potter Alliance. The event was a fundraiser for Youth Progress, which helps underprivileged children get the necessary things they need for success. We donated school supplies for this event, because it matched the theme and back-to-school was actively happening. Before we went in, we wandered around the library (because it's gorgeous) and took some pics. 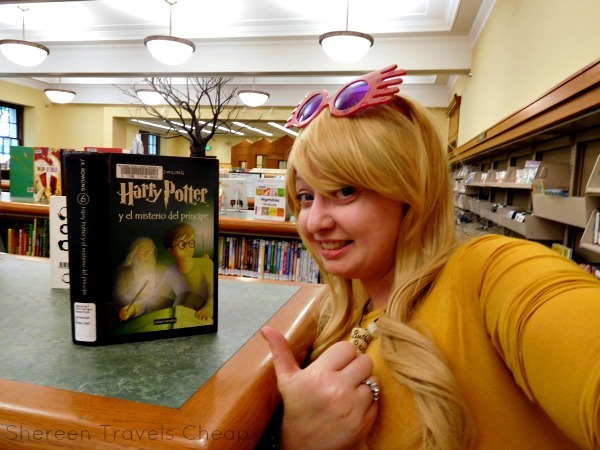 Here I am dressed as Luna, scoping out a Spanish version of Half Blood Prince. These stairs are the best. Too bad this photo didn't get the full effect. 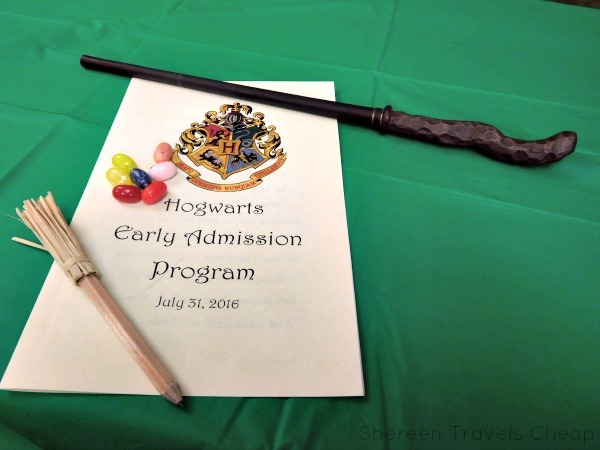 Once inside, we got these cute little broomstick pencils, a program for the day's activities and snacks, like these Bertie Botts. 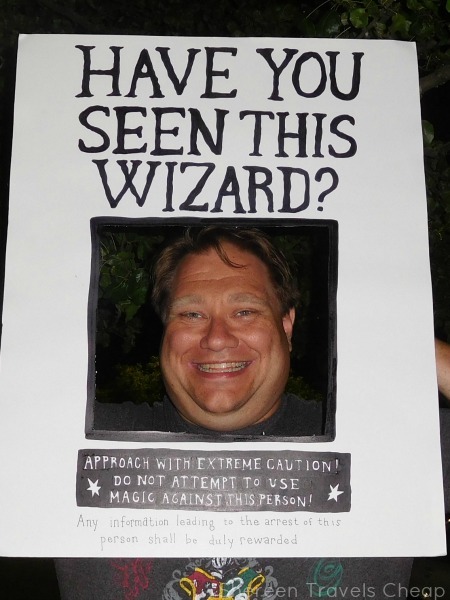 One of the "classes" was Defence Against the Dark Arts, which Harry excels at and Eric and I do not, apparently. We did this by playing the wizard version of Rock Paper Scissors: Reducto Protego Expelliarmus. Here are some last duelers. We played for house points. This little one helped keep track. After Transfiguration (where we had to transfigure a lump of Play-Doh into things from the books) and trivia (we came in second! ), they did a dramatic reading of the new book, which made me a little teary, I'll admit. 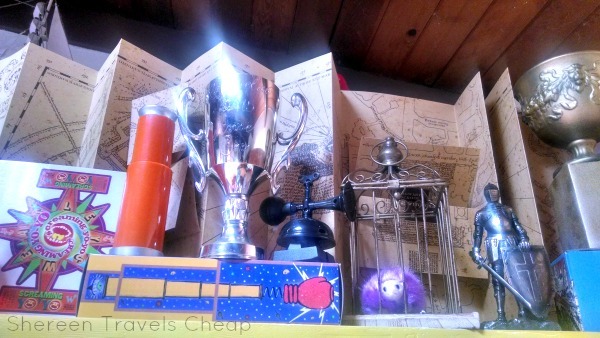 My Weasley Wizard Wheezes shelf. On Saturday we had our annual Potter Party (usually we do it whatever Saturday is the closest to the 31st, but had to push it this year). 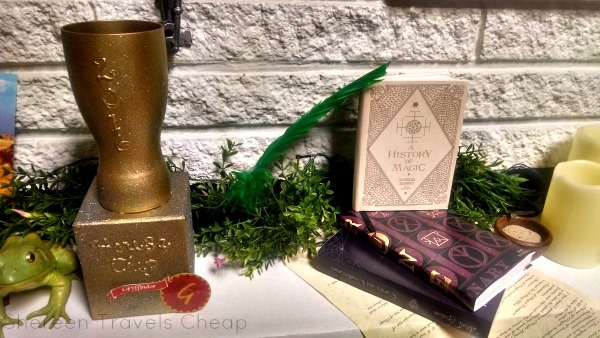 Over the last three weeks I've been really putting much of my effort into decorating "Hogwarts" and then "Diagon Alley" and making the remaining prizes and goodie bag inserts. 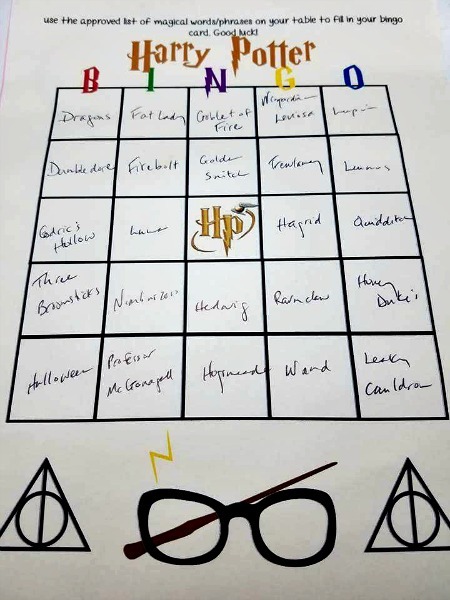 We played bingo, where I gave the guests a list of Potter-related words and allowed them to use whichever they liked to fill in their card. 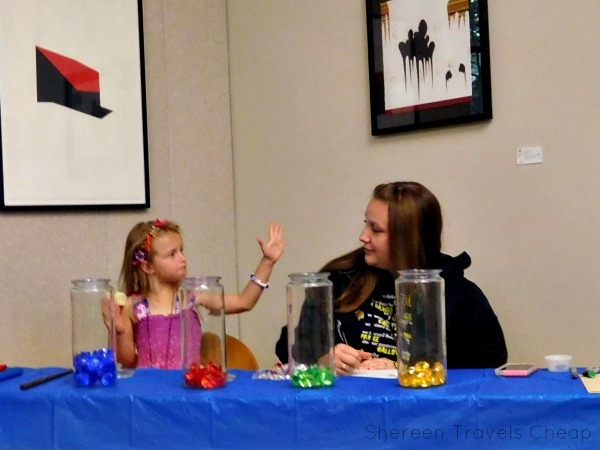 This way everyone had an equally random chance of winning. Winners received 25 points for their house, some sweets and Chocolate Frog cards. We sorted into houses while everyone was filling out their cards. It was casual. 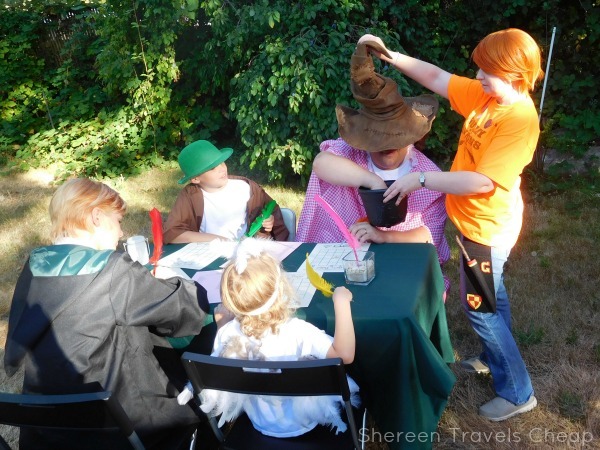 I put the sorting hat onto their head and they reached into a cauldron to pull out a house pin. I also had a different cauldron filled with wands that I made myself and attached tags to each with the wood, core, length and "personality". 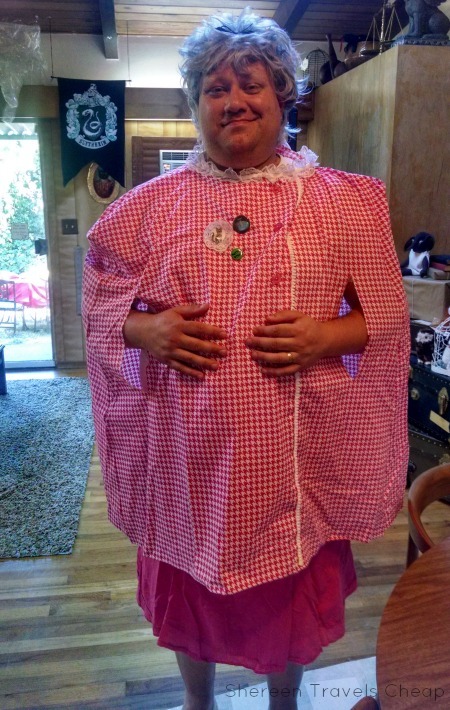 Everyone is required to dress up and my friends have a reputation for going all out, which makes me really happy. 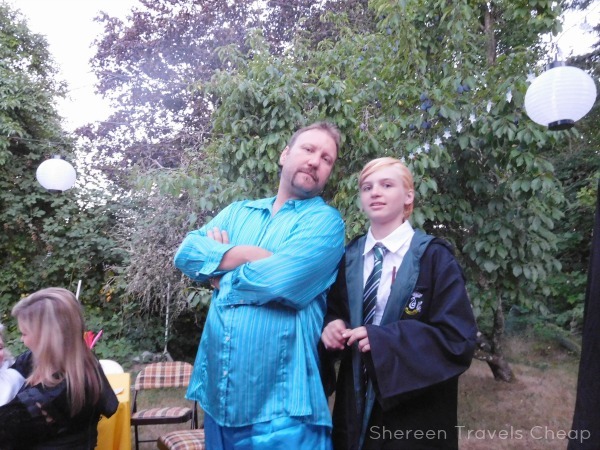 Here's Slughorn in his jammies with his daughter, Draco Malfoy. 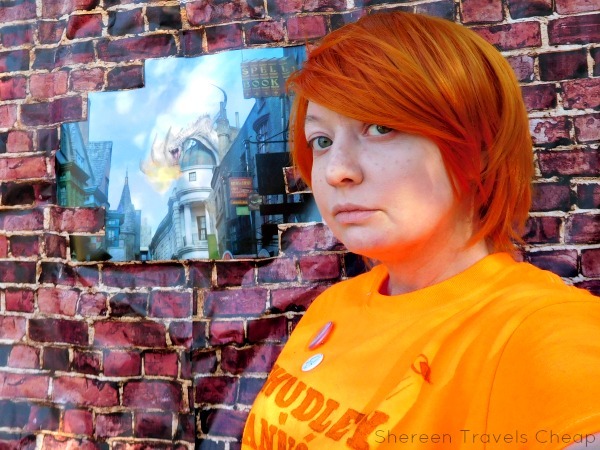 Here I am as Ron again, this time with freckles, in Diagon Alley. 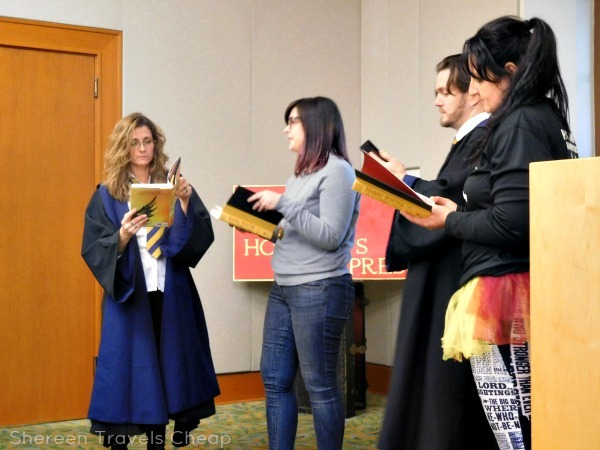 After trivia and a quick Horcrux Hunt, points were added up and the House Cup was awarded to...Gryffindor. I swear there was no preferential treatment happening there. 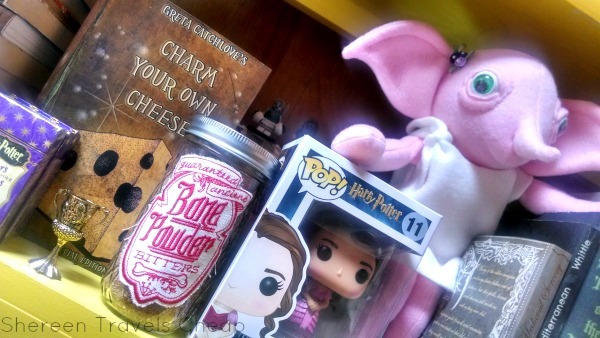 Each member of Gryffindor house got a special prize which included a mini house cup and some other goodies. We ended the night with Pensieve memories, where I asked anyone who wanted to to share a memory of their favorite part of the HP books or the party. 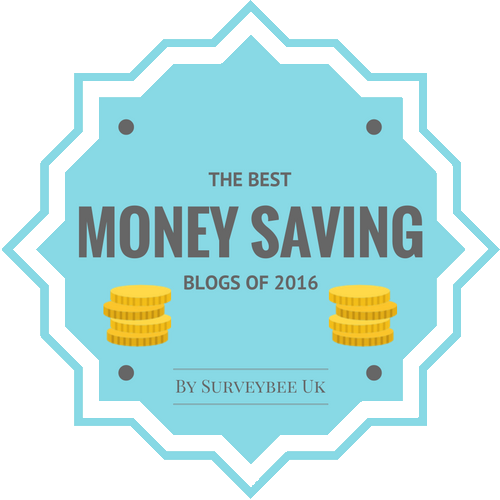 We'll share some of the best ones at the next party, which I'm already planning.